I really like visiting Australia. I went to Brisbane in August 2014 for the annual conference of the International Association for Applied Linguistics (AILA). Australia itself is always lovely, and I was impressed with Brisbane. The conference was right on the riverfront and the whole city center is easily walkable from there. Besides that, the whole flora and fauna are so different from what I usually see in the northern hemisphere that it really feels like being on an alien planet at times -- but at least everyone speaks the same language as me! Anyway, the conference was very interesting. The recently retired yet unstoppable Ann Cutler was one of the plenary speakers and she gave a good talk about the psycholinguistics of second language production. She also made a comment on the side that provided a good foundation for my later presentation: She noted that there is a growing trend in psycholinguistic research to study individual differences carefully. There were a lot of really interesting presentations, some very closely related to my own talk. Do studied cross-cultural differences in the perception of silence between Vietnamese and Australian people. She took as a definition of silence the absence of talk where talk might be expected or where talk is a possible response. This seems to be a nice statement of the presumption that many filled pause researchers make in their conceptualization of filled pauses as "filling" what would otherwise be a silent pause. However, Do's work wasn't about this per se: She observed a divergence between two groups of Vietnamese living in Australia: those who accommodate Australian norms and those who maintain Vietnamese norms. Another interesting presentation was by Hoang on the analysis of pauses during writing. This was something I hadn't even thought about at all, but it seems there is a growing number of researchers studying this. Hoang's idea was to relate the occurrence of pauses during the writing process to the use of metaphorical devices in the written product. I've become interested in a multi-modal study of the relationship between a student's pauses during their writing process and their pauses during speech production. I suspect some interesting correlations may be found, but it would be very exploratory at first. There were other really good presentations, too, but there were some surprisingly poor ones as well. One speaker explained that her methodology included giving both the control group and the experimental group the specified treatment. The results of both groups improved. Nevertheless, she concluded that the treatment was effective. The audience (not including me) criticized this point heavily and she refused to budge from her conclusion. Another speaker I saw completed the introduction and literature review of his presentation, and at the very moment I expected him to talk about the methodology of his study, he concluded his presentation -- with eight minutes to spare. I regret to say that probably some of my earliest presentations nearly twenty years ago may have made the same impression on more experienced researchers at the time. I hope I've improved somewhat since then. Anyway, in my own presentation, I focused on the results of the CCHP, but given the audience at AILA tend to be more practitioners, I aimed more toward implications for fluency evaluation. In particular, I introduced a measure I call the Hesitation Index which is basically an index from 0 to 1 of how hesitant a speaker is in their speech, with 1 being the maximum hesitant (i.e., utter silence). It is computed by looking at what a person actually says and then 'filtering' it back (i.e., by removing filled pauses, and collapsing repairs) to what they intended to say, what I call the 'essence'. The index is then calculated as follows. 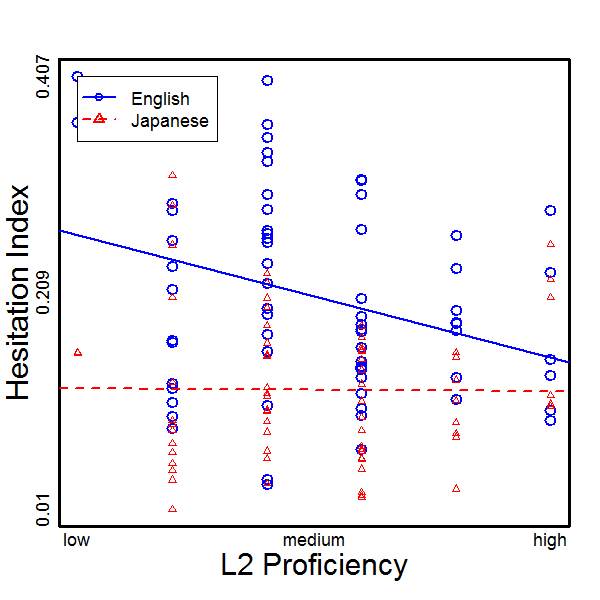 The data from the CCHP show that with this measure, the results look very nice with a consistent index across L2 proficiency when people speak in their L1, but a cleanly falling index when speaking in L2. Now, admittedly, the challenge in using this in practice lies in computing the essence, but given the acoustic signatures of various hesitation phenomena, I think it's not too far out of the realm of possibility to compute the index automatically. If you're interested in looking at the slides, you can download them here.